Your fundraising makes a vital contribution to the running costs of St David’s Hospice. HOSPICE EVENTS - JOIN IN! Fundraising makes a vital contribution to the running costs of St David’s Hospice. It costs over £3 million to provide the services at St David’s Hospice. Over 86% of our income is generated through community fundraising. Thank you. All the money donated stays local and helps local people. HOSPICE EVENTS – JOIN IN! Our Fundraising Dept. organises many fun events throughout the year for all ages to take part in. Whether it is a New Year’s Resolution, an life-long ambition or something to achieve during a gap year or break from work, there are so many exciting opportunities available. Achieve something magnificent, while providing vital funds to a local charity. anniversary, a christening, a wedding or even your celebration of Christmas time, Celebration Giving is a positive and unique way of celebrating a special occasion whilst supporting the work of St David’s Hospice. Today many people are making special occasions really count by choosing to ask for donations for St David’s Hospice instead of gifts, flowers and cards or instead of giving ‘favours’ at your wedding, letting your guests know that you have donated to St David’s Hospice instead (we can design small cards for your tables informing your guests of your choice). We can offer you donation envelopes that you can send to guests, or leave on tables at your celebration. They can choose to Gift Aid their donation which will add an extra 25p to every £1 donated, with no cost to you or them. Don’t forget you can also set up a Just Giving site to enable friends and family to make their donation/gifts to the hospice online. For more details, please call St David’s Fundraising Department: 01492 879058. If you have an old mobile phone and you’re wondering what to do with it. Well now you can recycle it and help St David’s Hospice! 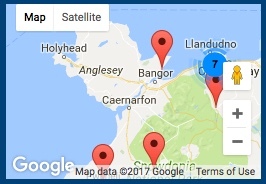 O2 mobile phone stores on the High Street, Bangor and Victoria Centre, Llandudno have installed a box where you can put old unwanted handsets which will be recycled, raising funds for St David’s. You can also drop off your unwanted phones at any of our Hospice shops or into the Hospice itself. Did you know you unwanted Euros, European Notes and coins, other foreign notes and coins, pre-decimal notes and coins, old decimal 50p, 10p, 5p and half-penny coins can be turned into cash for the hospice. Please consider donating them to us. You can donate coins/notes at the local St David’s Hospice Shops or at the Hospice itself.